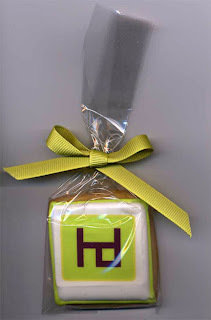 Super-cool Hilary Druxman promo cookies! I had a great visit to the new Hilary Druxman store at the Winnipeg James Armstrong Richardson International Airport today. I'm a big supporter of local businesses, especially ones that bring something new or special into our relatively small market. When I first ran across the Hilary Druxman store in the Exchange, I called it "one of Winnipeg's rare New York boutique experiences." And it still is. And like the Exchange location, the new one brings some class to what used to be the horrible airport smoking-room off of the food court. "Smoking room:" yikes. It's amazing what a touch of paint and class did to the joint. However, I am told that "yellow tar" is extremely difficult to cover with paint. Good to know! The Winnipeg Free Press has an article about the new location here. RRC Business Conference + Blabby McGee = result! What is surprising to me, but perhaps shouldn't be, is that the store's new location came about all because of a series of casual conversations that happened after I attended Red River College's Directions Business Conference in January. At the conference, Hilary Druxman spoke to RRC Business Admin and CreComm students about embracing risk, commitment, and adaptability. It was a good presentation, and one that I might have missed were it not for a tip from a longtime friend, who told me that Hilary Druxman is the only person from whom she ever buys - or would buy - jewelry. A week or so after the conference, I had lunch with Carly Thompson, who I've called "the genial face of Winnipeg Airports Authority" because she is! I told her about meeting Hilary at the conference and that her products would be a no-brainer for the airport, given the nature of the traffic and target audience. I had forgotten all about our discussion until Carly told me that not only had the deal gone though, but the store was actually open. So, I took full credit for the new location and demanded a large finder's fee. Kidding! All jokes aside, it was very touching to go to the new store today and be treated like family by general manager Tracey Young (pictured here with the Free Press article), who gave me all too much credit for getting the ball rolling (and even that's a stretch); really, "generous" does not even begin to describe her. It was great to see the store full of customers - travelers and airport employees alike - browsing the offerings and digging into the complimentary cookies emblazoned with the Hilary Druxman logo. If everyone around the world is "six degrees of separation" from everyone else, Winnipeg must be less than half a degree; I'm pretty sure that means we're all family.